City in Palestine, apparently the native place of the prophet Micah; mentioned in connection with Lachish, Achzib, Mareshah, and other towns of the lowland ("shefelah") of Judah (Mic. i. 13-15). Jerome ("Onomasticon," s.v. "Morasthi," and prologue to his commentary on Micah) places this city at a short distance east of Eleutheropolis, and states that in his time it was still a village of moderate size, containing a church built over Micah's tomb. Robinson ("Researches," ii. 423) concludes that it must have been near Mareshah, while Thomson ("The Land and Book," ii. 360) thinks these two towns are identical. The text of Micah (l.c. ), however, clearly differentiates them. Among the Jewish commentators, only Ibn Ezra and David Ḳimḥi consider Moresheth-gath as the name of a place; the Targum of Jonathan (to Mic. i. 14) and later commentators, among them Rashi, translate these two words by "those who caused you to inherit Gath," meaning the family of David. 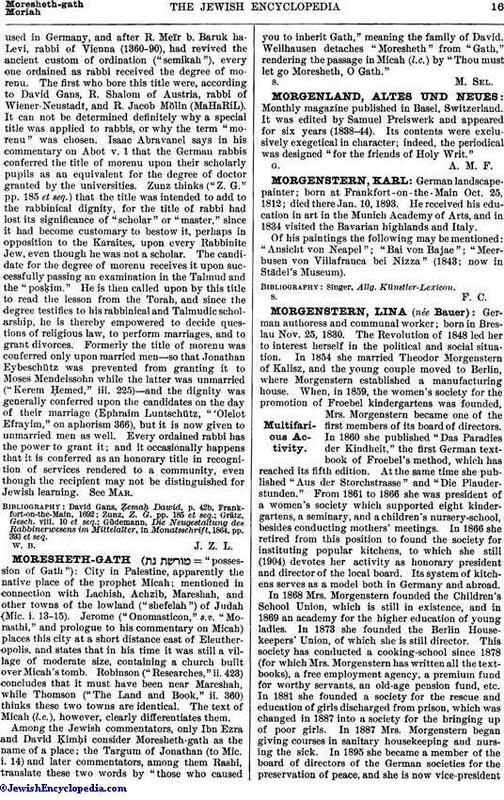 Wellhausen detaches "Moresheth" from "Gath," rendering the passage in Micah (l.c.) by "Thou must let go Moresheth, O Gath."